I recorded the entire longwave band for about 1 hour at Lista back in January. I have several gaps in my QSL collection from longwave stations. 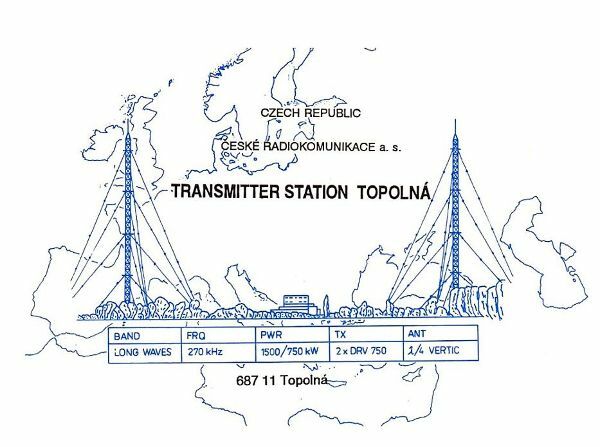 One of the stations I have never bothered reporting was the Czech longwave station at Topolná. Motivated by rumours of the station closing down at the end of February (it is hard to obtain QSLs from stations which have closed down!) , I sent along a CD and a letter directly to the transmitter station at Topolná. Some weeks later I received a nice full data QSL card (depicted above) and a postcard of Topolná village. The longwave transmitter wasn’t turned out on February 28, 2014 though, as originally annnounced. The power of the transmitter, however, was reduced to just 50 kilowatts. Compared to the 650 kilowatts used when I heard them in January, this means that the signal is now considerably weaker than it was. The transmitter still transmits the “Radiožurnál” programme of Czech national radio (“Český rozhlas”).